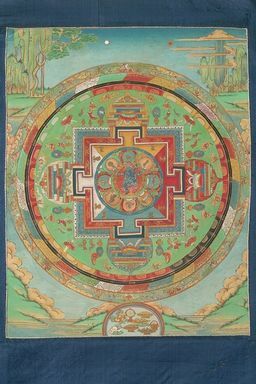 Hevajra Vak Mandala from a set of mandala paintings based on either the Vajravali or the Mitra Gyatsa literature. The Vak (speech) form of Hevajra has one face and four hands. Copyright © 2019 Himalayan Art Resources Inc. Photographed Image Copyright © 2009 American Museum of Natural History.